Let the professionals at Hurn’s Superior Alignment take care of your car or truck or big rig! 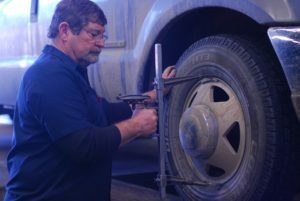 At Hurn’s Superior Alignment Inc., experienced technicians can facilitate any type of front-end repair. From major front-end component replacement to accurate alignments, you can be assured your vehicle will operate smoothly and safely. To provide our customers with the best service possible, we offer the time-tested success that comes from reliable men that have specialized in this type of work for years. For more than 45 years, the Hurn name has been known for honest work at competitive prices. Alignments start at $59 for cars but only $29. minimum fee if we check your parts or alignment and no adjustments are done. We’re open Monday thru Friday, 7:30 am to 5:00 pm. Call 501-374-5907 to schedule to drop your car off early morning or to schedule one of our hour long appointments while you wait. You may prefer to schedule to leave your vehicle early one morning to be picked up at the end of the day or before. We would contact you with any concerns about your vehicle after evaluation. Save those tires from premature wear and improve your gas mileage today and be assured your undercar is okay. Take Exit #1, Springer Blvd., off Interstate 440. Turn right at the bottom of the ramp. As soon as you cross the railroad tracks, take the immediate left onto our street. We are at the end of the road on the left.